L-aspartate-α-decarboxylase was extracellularly expressed to enhance its production for β-alanine biosynthesis. L-aspartate-α-decarboxylase and cutinase were coexpressed in Escherichia coli; more than 40% of the L-aspartate-α-decarboxylase was secreted into the medium. 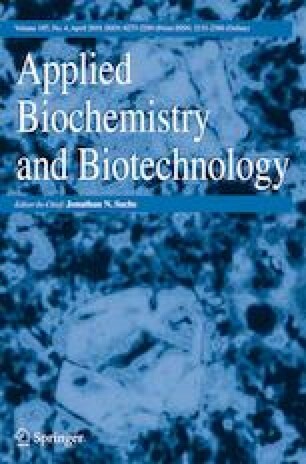 Selection of best conditions among tested variables enhanced L-aspartate-α-decarboxylase production by the recombinant strain. The total L-aspartate-α-decarboxylase activity reached 20.3 U/mL. Analysis of the enzymatic properties showed that the optimum temperature and pH for L-aspartate-α-decarboxylase were 60 °C and 7.5, respectively. Enzyme activity was stable at pH 4.0–8.5 and displayed sufficient thermal stability at temperatures < 50 °C. In addition, enzymatic synthesis of β-alanine was performed using extracellularly expressed L-aspartate-α-decarboxylase, and a mole conversion rate of > 99% was reached with a substrate concentration of 1.5 M. Extracellular expression of L-aspartate-α-decarboxylase resulted in increased enzyme production, indicating its possible application in the enzymatic synthesis of β-alanine.